Slinky toy keeps squirrels away? It has been almost two years now since I've heard the news about how Kentucky grandmother got rid of the squirrels by attaching slinky to bird feeder pole. In her own words, she has been testing different squirrel proofing tactics for some time and finally concluded that slinky on bird feeder gives the best homemade squirrel proofing results by far. Being honest (as grannies usually are), she also added that slinky is not exactly 100% effective against the squirrels. But guess what? I did my own research and I've found out where she went wrong and I am going to share that with you. 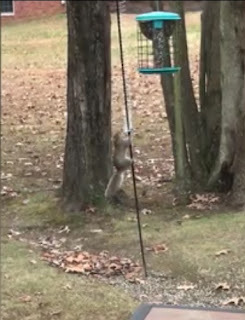 What you see to the left is the actual photo of granny's bird feeder with the squirrel trying to climb the pole up and against the slinky that's pushing the squirrel down. At the first look, everything seems to be in place here. But something is in very wrong, indeed. Can you guess what? "The squirrels tried to climb the pole for two days. After they fell off many times, they gave up. A few are now trying to jump from the tree to the top of the bird feeder. If they land it, I let them stay on the feeder for a snack." 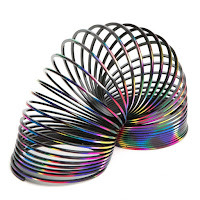 You can't blame slinky for defeat because it protects bird feeder from below! Also, please note that some gifted squirrels may jump 5 to 6 feet to the side and placing feeder next to the trees is big "no no" practice. Even the best and the most expensive anti-squirrel bird feeders lose great deal of their squirrel proof capacity if placed near squirrels launch pad! If you'd like to know more tips like this, please read my anti-squirrel bird feeding strategy. Please make sure you grab a big cup of coffee first because it's a long read... but it will pay out if you are fed up with squirrels and you don't want to make the same mistakes as granny did. Slinky is truly effective against the squirrels. In fact, it acts like anti-squirrel baffle of some sort. Now let's see real life example how effective slinky is against the squirrel. Enjoy!